Let’s face it: houses are expensive. You spend years working, paycheck-to-paycheck to pay for a house you rarely get to enjoy. All that space goes to waste, because by the time you get home from your long, drawling day at work you’re ready to plop on the couch and watch some television or head straight to the sack for some good ol’ shut-eye. So, your sad house sits in the dark, unused and unloved. The financial strain big houses put on working class Americans has left many to wonder what the point of it all is. It is this very attitude that has spawned the tiny house movement. What is the tiny house movement, you ask? Think of everything you actually use in your large house and condense it into a compact, cozy home filled with all the essentials. There you go. You’ve got yourself a tiny mobile home. On, the outside, it looks like a scaled up storage shed. But on the inside, you find all the essentials such as a tiny kitchen perfect for baking miniature, tiny-home sized pies and casseroles. It’s worked for the hundreds of people joining the movement, so just think small and hold your breath! So why are these tiny homes so popular? The mobility is convenient, for one. You could literally take your house anywhere and move on a whim if you so choose. While many of these homes are roughly 500 sq. feet, the utilities and cost of living is unmatched. Many of the young, hip couples are joining the movement because of environmental concerns as well. This tiny home forces people to live simple, stress-free lives. 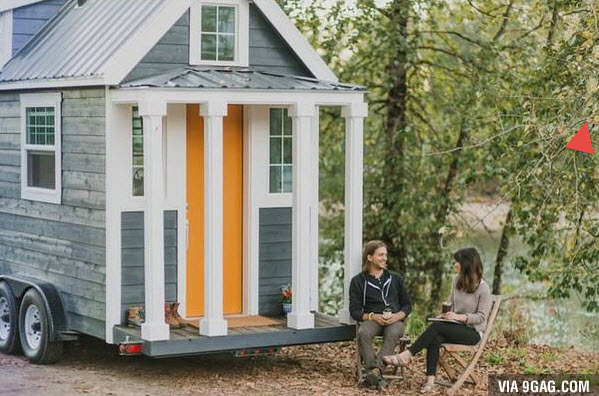 Rather than crowding your home with unnecessary things, the tiny home gives you the option to let go of extravagance and opt for necessity instead. You’ve got your toilet. Your kitchen. Your bed. Your chairs. Your desk. Everything you need, just closer together. And while we don’t build or specialize in tiny roofs or tiny homes, let’s not forget the importance of having a great roof over your head, either. Mobile home roofing is our specialty. Whether you’re living big, or living, really, really small, we’ve got you covered. Literally. If you’re interested in getting a new moible home roof, whether you’re ready to join the tiny house movement or not, give us a call at 1.800.297.3758 or contact us online today. We can’t wait to hear from you!